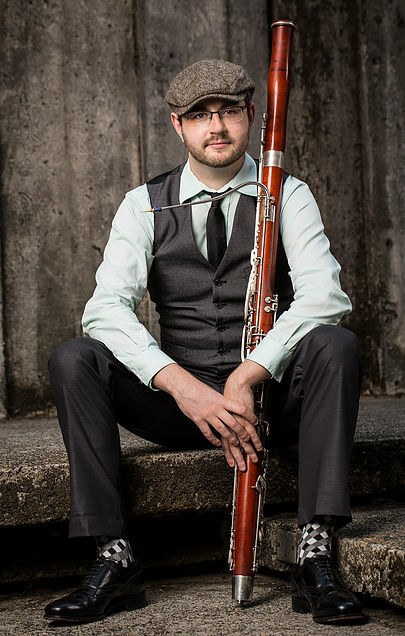 Dr. Ryan Reynolds is the Visiting Assistant Professor of Bassoon at Miami University. An award-winning chamber musician, Dr. Reynolds has won prizes at six national chamber music competitions including the Gold Medal at the 2014 Fischoff National Chamber Music Competition. He tours internationally as a member of the Akropolis Reed Quintet and has released three studio albums with the ensemble. The latest of these albums, The Space Between Us, was released in March, 2017 on Innova Recordings. In later 2017, his collaboration with legendary clarinetist David Shifrin on the studio recording of a new chamber music version of Carl Nielsen’s Clarinet Concerto will be released on Delos Records. Dr. Reynolds has performed with orchestras throughout the United States including the Ann Arbor Symphony Orchestra, Traverse Symphony Orchestra, and Savannah Philharmonic Orchestra. A passionate educator, Dr. Reynolds has given masterclasses in Germany, the United Arab Emirates, and at many American universities including the University of Texas-Austin, the University of Michigan, and Louisiana State University. Additionally, he was a recipient of the 2015 Fischoff Educator’s Award for creative and interactive educational programming. A native of Michigan, Dr. Reynolds received his Bachelor of Music and Master of Music degrees from the University of Michigan. He received his Doctor of Music degree from Florida State University, where he also served as a Graduate Teaching Assistant. His primary teachers include Eric Stomberg, Jeffrey Lyman, and Jeff Keesecker.